“En plein air” is a French term referring to the act of painting outdoors with natural subjects and light. 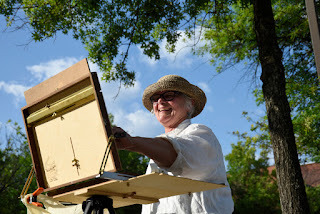 On Friday, July 14, ten notable local artists will showcase their skills al fresco throughout the late afternoon and evening as part of what has become an annual festival for downtown Northampton--Arts Night Out En Plein Air. Please join Susan Barocas, Valerie Bassett, David Brewster, Jeffrey Gatrall, Paula Gottlieb, Elizabeth Lehman, Robert Markey, Robert Masla, Scott Prior, and Jan Ruby-Crystal in the open air “studio of Pulaski Park 4-8 pm. By happy coincidence, July’s Arts Night Out falls on Bastille Day, a national day of celebration in France and a great opportunity to add a little French flare to the occasion. Everything is free and interactive as artists welcome onlookers to watch them work on original pieces and engage in conversation about the technique. Robert Masla will be doing two exciting hands-on demonstrations using special canvases and paints. The public is also invited to create their own en plein air paintings by borrowing one of 20 water color kits provided by Chartpak. Adding to the excitement is a special appearance by the tinydance project. They begin with a community music and movement class for all ages and abilities on the park lawn at 4:30 pm. This is followed by two tiny tour preview performances on the tiny stage at 5:30 and 6:30 pm. The festival also hosts Prone to Mischief, a group of street musicians known for their colorful costumes and high energy. The band will keep the atmostphere lively by channeling its inner French Quarter. This community event is funded in part by the Festivals Program of the Massachusetts Cultural Council, the Northampton Arts Council and Florence Bank.